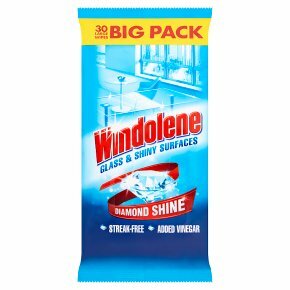 Glass & Shiny Surfaces Wipes. Diamond shine. Streak-free. Added vinegar. 4 action system Dissolves grease, Lifts off dirt, Cleans with vinegar, Leaves a streak-free shine Cleans windows Glass & shiny surfaces wipes. Pull back the resealable label, take out the wipe. Wipe surfaces and allow to dry to smear free shine. After use, reseal label to prevent drying out. Do not flush down the toilet. Usage Instructions Suitable for all glass and shiny surfaces such as windows, glass doors, mirrors, car windows, formica, vinyl and plastic surfaces. Not suitable for plasma and lap-top screens, wooden and waxed surfaces. Always test on an inconspicuous area first. Pull back the resealable label, take out the wipe. Wipe surfaces and allow to dry to smear free shine. After use, reseal label to prevent drying out. Throw the used wipe in the bin. Do not flush down the toilet.